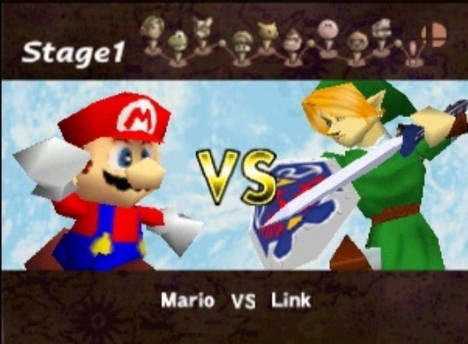 Like other bloggers have stated in this particular monthly musing, SSB 64 was not the first game I've played, nor was it necessarily the best. So why do I consider it the one game that marked my emergence as a gamer? To answer that main question, let's fire up the Delorian and turn the clock back all the way to 1999 when I first sat down to play Super Smash Brothers. I was nine-years-old at that point in time, and I had experiences with games before. At six or so, I played my first game on the honest-to-god original "Grey-Brick" Game Boy. Tetris to be exact. I played it all the time, it was so simple to pick up and understand that I mastered the controls in about 30 seconds and played it obsessively from then on. And I sucked at it. Horribly. Different story with my younger brother. He's always been a whiz at games, as far back as I can remember. Anytime I exulted in what I thought was an incredible achievement, he would beat it in five minutes without breaking a sweat. So I resigned myself to always being a back-seat player. You know, the one that sits down in the basement behind the person holding the actual controller, clutching at the cheat guide as it it was a lifeline connecting her to the game she so desperately wanted to explore herself but couldn't bear the embarrassment of failure again. I was willing to play Navi to my sibling's Link if only, for a moment, to have some feeling of worth, a feeling that I could be useful and competent. As you can tell, my self-esteem was pretty much in the toilet back then. But because of that detachment, I have no real Memory Cards or nostalgic moments from those days. Because I didn't have that personal experience of pushing the buttons or reacting to an enemy or physically hitting the right combo to slay the final boss, I have virtually no emotional sentimentality to those older games beyond "Oh yeah I remember that, it was really cool." However, even more important than that, I had no conscious knowledge of what I was missing. I knew the experience would be different if I was the one who saved the princess instead of watching my brother, but by the time 1999 rolled around, I had stopped caring. I had more important things than videogames to worry about, and apart from the few series like Mario, Donkey Kong, and Pokèmon that we owned already, there were no other games that were worth checking out. I figured they were all just videogames, and I'd never be able to beat them myself, so there was reason to bother with anything else. But as soon as I sat down in my well-worn seat on the couch behind my brother to inaugurate SSB into our selective game library, I was confused. The commercial for the game showed four characters - Mario, Donkey Kong, Yoshi, and Pikachu - that I was familiar with. But what the heck is this pink blob? Or this dude in a space suit? This green guy ... I think his name's Zelda, my friend down the street has one of those games ... What's going on here? 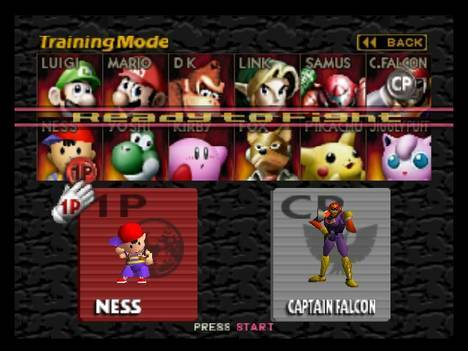 It was at this point Super Smash Bros. opened the first door to the start of my true gaming experience. I realized that these characters must have been important or the developers wouldn't have spent the time and resources to put them in. When reading the little biographies included with each character, I heard stories of great exploits, adventures, victories, struggles, and legends. Each of these characters was a legend, and I had missed out on all of them. Like previously mentioned, I felt a desperate desire to connect with these games and explore all their mysteries and become a part of that legend. 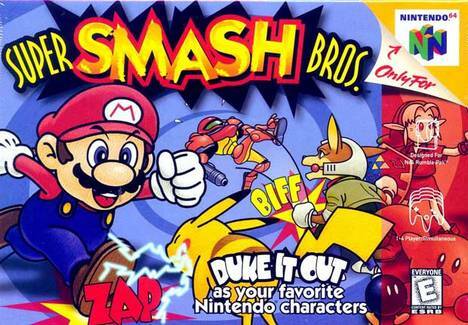 Even then, however, it took a long time for me to even build up the nerve to attempt to play Super Smash Bros. The N64 trident felt bulky and foreign in my hands, like it was constructed for someone else and I had stolen it from its rightful owner. But I had made up my mind, I wanted to see what was behind that door for myself. I went straight to training mode and started working. Like Tetris, the controls were simple enough to learn quickly, and in no time at all I was proceeding to grind my analog stick into grey plastic dust. Then, a miracle happened. A week later I defeated Master Hand. It was arguably the greatest moment of my gaming career. Finally, after so much heartache and disappointment, I had proved myself wrong and completed a game. The final door wasn't just opened; I kicked it off its metaphorical hinges. Super Smash Bros. helped pave the way to the gamer I am now by giving me a chance to finally venture out of my comfort zone; to have the confidence to try new experiences, to fail, and then to keep trying. Even if I'm defeated, I know that everything I've achieved is from my own skills, skills that can be improved. In the end, it has taught me that my victory lies not in defeating Master Hand, but in making the journey to face him.